Also It fits the Watch versions: series1, series 2, series 3, sports & edition. This listing is for the replacement strap only, the watch is not included. 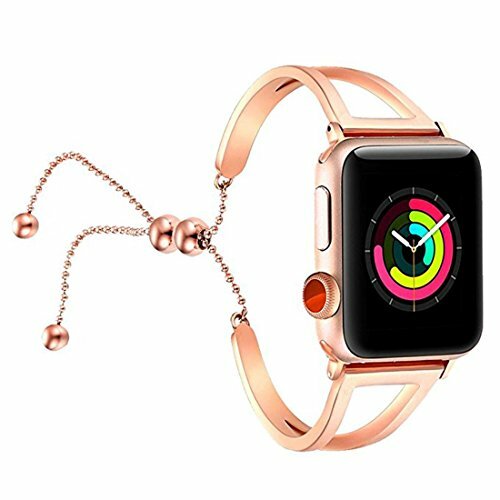 Fashion jewelry smart watch cuff :This stylish dressy watch band is perfect for girls and women and the best gift /presents for Wedding day, Birthday, Valentines' day, Mothers' day, Christmas, Thanksgiving Day etc. Material: Nickle free, allergy free, 304 stainless steel, durable and textured. Also the Iwatch Strap is with nice pendants which will bring you prosperity and wealth. Elegant slim band set. Just enough bling to make it very fashionable. Makes your iwatch band look like a jewelry. A nice option to wear the watch with your dresses adnd brings you lots of compliments.